Oh great applescript gods, I need help again. I've got folder, subfolders and subfolders of subfolders. Hiding inside all of these folders are tons of images in RGB except a very small number which are in CMYK. I need to find those CMYK images. I'd like a script where I can select the top level folder and have the applescript go through every folder looking for images and if it finds one that is not RGB, write's it's name (and optionally it's path but as long as I have the file name, that's fine) to a simple text file on the desktop called Problem_Images or something. If someone is kind enough to help, please check for the color space of the image not being RGB. I need to know which ones aren't RGB so I can fix them. 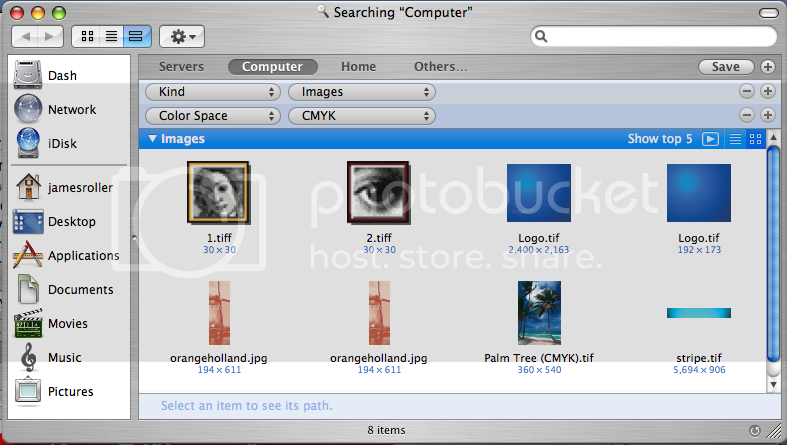 In the Finder, key in Command F.
Thanks for the tip. I didn't know I could do that. I rarely search for things on my computer and if I do, it's just for a filename. This depends on spotlight I'm guessing? I've turned it off on my machine at home so I'm not turning up any results. At work spotlight is still turned on so it will probably work as expected. We'll find out monday morning. Thanks for the great info... it's appreciated. That is actually a great question... I don't actually know if the Command F keys invoke a Spotlight Find or a different sort of Find. Maybe someone will enlighten both of us.